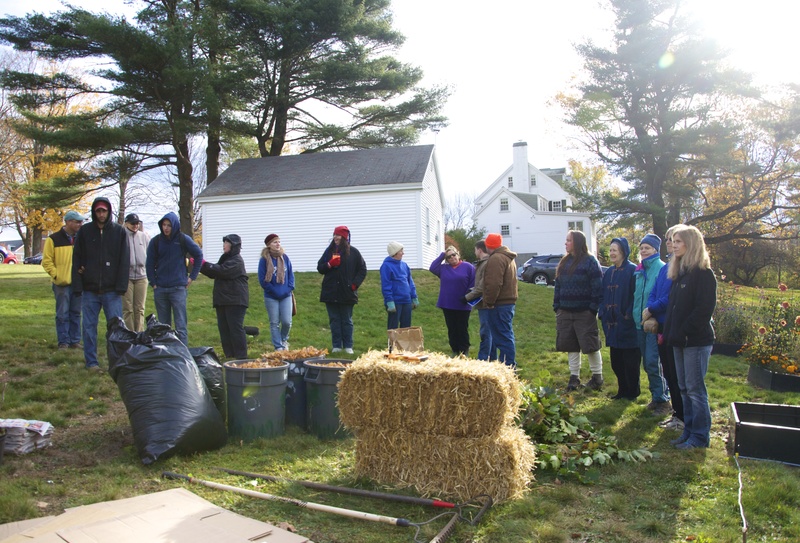 On October 26, 2013, members of Colby-Sawyer’s Eat Your Yard sustainability group held a Sheet Mulching Workshop at the College’s President’s house. The students were accompanied by Professor Leon Malan of the Environmental Studies Department. A total of 15 community members attended this informative event to learn more about sustainable gardening. The guest speaker at the event, Dorothy Perkins, is the educational program coordinator and Field Specialist in Food and Agriculture at UNH. Dot works directly with commercial growers in all agricultural areas and the general public. She explained to the group about the benefits of laying down the sheet mulch. This simple and straightforward method allows gardeners to work “smarter rather than harder”. Working with nature offers many benefits such as improving crop yields and increasing the health of plants and soil. The area that is sheet mulched will create high quality soil over winter and will then be ready for the spring planting season. 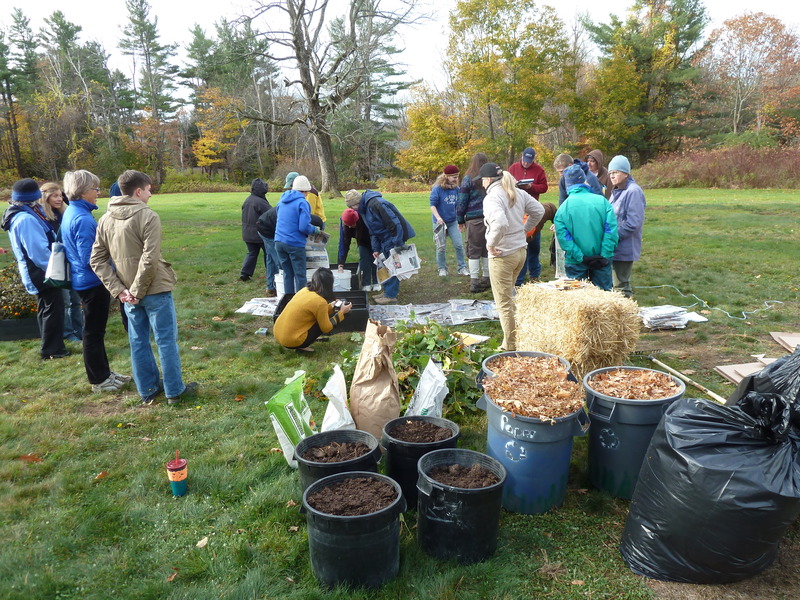 This workshop was an excellent way to attract community members who may have been considering gardening or current gardeners who wanted to learn more about permaculture practices. Demonstrating this simplistic yet productive gardening practice can help people to feel less intimidated about starting a garden on their property. People may feel as though they need to put excessive amounts of labor and time into a garden, but Dot Perkins explained how “it’s not about working harder it’s about working smarter”. Working with the natural environment and understanding the needs of the plants (nitrogen & phosphorus ratios) is vital to having a flourishing garden. Increasing the number of educated gardeners greatly benefits the community because they can influence and encourage others to apply different practices to their lawns or already existing gardens. Eventually, having raised beds and sheet mulching areas would be common within the community. Eat Your Yard educates and demonstrates valuable skills and information to the community in order to promote local grown food and this workshop is a prime example.